Every day our homes, beaches and rivers come under threat from our own bad habits in flushing the wrong things down the loo. 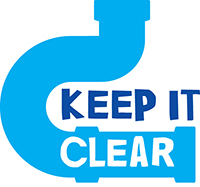 There are more than 300,000 sewer blockages a year in the UK caused by fats, oils, greases and other non-biodegradable items. By following the simple advice on this page you will help to prevent blockages that can lead to homes being flooded and waterways becoming polluted. Sewers and treatment works are built to deal with human waste and water, yet every year in the UK we flush away two billion items that shouldn’t go down the loo. Some of the more stranger items that have been found in the sewers have included, toys, false teeth, mobile phones and even giant orange sewer monsters. The only things that should be flushed down the toilet are the three Ps – pee, poo and paper. For everything else - Bag it and Bin it. Toilet paper decomposes naturally and can be flushed away safely, but non-biodegradable items, such as wet wipes, should be put in the bin. Wet wipes are one of the biggest causes of blockages in sewers and at wastewater treatment works. Even wipes described as “flushable” cause blockages and the biodegradable ones often don’t spend long enough in the sewer to start to decompose. On its website, the National Childbirth Trust suggests alternatives to costly disposable baby wipes.